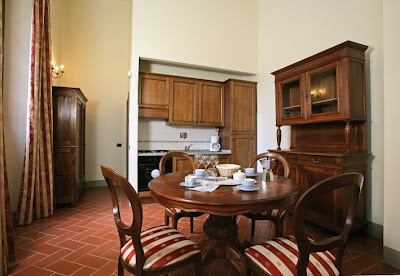 Kitchen and Residential Design: Reader Question: How do I decorate my Tuscany dining room? Reader Question: How do I decorate my Tuscany dining room? Help! I am in the process of gutting my first floor and I'm going to get a Tuscany dining room. I want to decorate the room with bunches of dried roses but I'm worried that they're not right for a Tuscany theme. Oh man, there is so much wrong here I don't know where to start. Before you spend a dime, stop what you're doing. 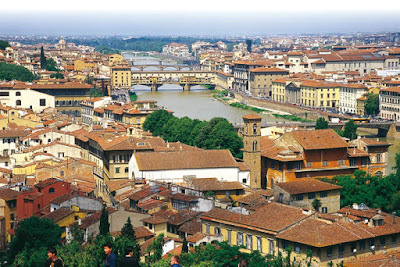 Stop and then take $1500 out of your budget and fly to Florence for a couple of days. Well, maybe $2000. Whatever it costs, it will have a value that transcends its price. You see, while you're there you'll gaze at what the real Tuscany looks like and hopefully you'll forget all about this dining room you have in mind. Oh, and as a point of order, Tuscany is a noun and Tuscan is an adjective. 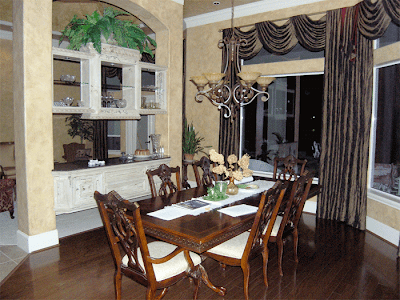 What you have in mind is a Tuscan dining room, not a Tuscany dining room. If I have anything to say about it you won't have either, but I'm getting ahead of myself. This Tuscan thing that you see in your mind is an entirely American invention. It's not even an homage, it's a cartoon. Here's what a dining room in the real Tuscany looks like. Note the lack of bunches of dried roses. There are no fake sunflowers or clots of plastic grapes either. There aren't any framed posters with nonsensical Italian phrases hanging on the wall, nor is there any faux painted brick. It's a basic, small table jammed into the space not already taken up by a tiny kitchen. It's neat as a pin, it's simple and it's orderly. But real Tuscan style isn't about decor or themed dining rooms. It's about views like this. 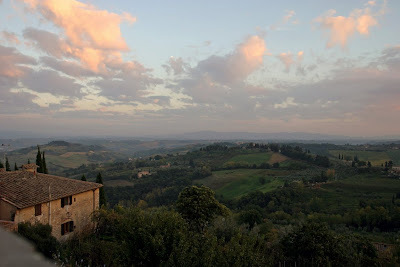 Views like that beget a worldview that's entirely Tuscan and how things look over there are a product of that worldview. The real Tuscany is about making the best use of a small space. The real Tuscany is about embracing life, it's about authenticity, it's about quality over quantity in everything. There's no theme here, there's no attempt to recreate a magazine spread or a dream house from some Developer's unimaginative mind. The truth of the matter is that unless you can see the Arno river pass under your dining room window, no amount of clutter will give you a "Tuscany dining room." Man! That room up there burns my eyes. Please don't do something like that in your home. Sorry to be so brutal but what you're asking is for some kind of permission to turn your home into a miniature Las Vegas and that's something I refuse to go along with. Listen, your dining room and indeed your whole home should tell your story, not somebody else's. The things you decorate with should be your things and if you're going to buy a dining table, buy one that's classic enough and made well enough that you can pass it on to your kids. Then in 50 years when it's in your daughter's home that same table will tell your story as it passes into her story. I suspect that's the feeling you're after. A feeling of permanence and a feeling of knowing you belong somewhere. That sort of thing isn't a theme, it's a way of life. So if you want to bring some Tuscan sensibilities to your dining room, by all means do so. But study the real place, not The Venetian or the Bellagio. While you're enjoying the quick jaunt over to Florence I so strongly recommend, have your photo taken with the Duomo in the background then get it blown up and framed. Hang it in your dining room. I don't think it's possible to get more Tuscan than Florence, and it'll be yours. Authentically. If you like bunches of dried roses, go for it. Just be sure that you like them and that you're not just adding them to advance some kind of ill-advised theme. So instead of asking me if they're appropriate, the person to ask is you. What do bunches of dried roses say about you? If you're happy with the answer than hang them by the bushel. If you're not happy with the answer then don't. If you're not sure then don't do anything. It's pretty simple really. Bravo! Thanks for being candid with your answer. So many people take the route to interior disaster by following these tacky trends. A person needs to ask themselves what it is they like about a certain style and perhaps incorporate a few of those elements in their home. But an entire "theme" is just silly, pretentious, and all too soon a huge and often costly mistake. Thanks for the positive response Mimi. I was worried (almost) that I would incite some kind of ire with my response. I get frustrated when people pull themselves out of the equation when it comes to this kind of stuff. Restaurants and hotels have themes, not homes. Good advice is sometimes hard to get these days. Your reader should be so thankful that you have given him or her so much to think about. The simplicity of either using things that you already have or looking for that special piece to anchor the room will certainly save money over getting a "Rooms to Go" look. The Cote de Texas blog (awhile back) had an entry showing a readers transformation from a busy overdone look to a beautiful Swedish clean look. It was thought provoking for those of us who may need to pare down the look. I ditto the "Bravo"
Thanks Ming, I know the post you're talking about from Toni's Cote de Texas. Her posts are always great examples of how to draw inspiration from an image and then to interpret it. I love the idea of building a legacy instead of attempting to find some kind of instant character. Thanks for this brave post. It's really needed - just because we fall in love with a place doesn't mean we should create a stage set in our home. I once went into a house (in Chicago) that was inspired by Venice, the owner said. Gold frames, red velvet tassels, nothing to do with the actual place. Oh, she did have a bright painting of San Marco.... Anyway, keep up your incisive observations. You have much to teach us. Thanks for your comment. I've been through the same "Venice" house countless times, only they've all been in Florida. Funny how that works. You conjure and image in your comment that makes me cringe. I can see the bright painting of San Marco in my mind's eye. It's hard to stay constructive in the face of that sort of thing. While I am a big "un-fan" of Tuscan style, I don't have one bit of a problem about styles that are entirely foreign to their inspiring countries. Chinoiserie, Federal/neoclassical, early Arts and Crafts (a la William Morris), etc., etc.--all these are derivative styles inpired by very different tiles and/or places. Somebody who asks about the appropriateness of dried roses in a Tuscan-themed dining room is in a whole other league from asking about how to place Georgian tall boys or a Chinoisserie chest of drawers. Period pieces are one thing and Vegas-style themes are another all together. I suspect you know that.